In 2002 Vattenfall AB identified a need for a new transformer for their underground hydropower station Stalon, located between Lake Malgomaj and Lake Kultsjön by the Ångermanälven River in northern Sweden. There were certain issues that meant a mineral oil transformer was not a desirable option. Firstly the transformer was to be placed underground, so fire safety was critical, secondly, and just as importantly, the power station was located in an environmentally sensitive area, where spillage of mineral oil could cause large amounts of damage. When the transformer was put out for tender VA Tech (now Siemens Austria) offered the option of using MIDEL 7131 as the cooling fluid rather than mineral oil because it is fire safe and readily biodegradable solving both of their client’s problems with one solution. M&I Materials were involved in the early stages of the tendering process during 2003, supporting VA Tech by providing technical information related to MIDEL 7131. 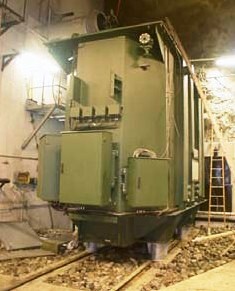 Once Vattenfall were satisfied that the MIDEL option was a viable one for the voltage level the contract for the transformer was awarded to VA Tech. They set about building a world first large generator step up transformer which was Midel filled and the transformer was successfully tested at their factory in April 2004. Then came time to ship the transformer to site, this brought added complications since it had to be drained and refilled in place, due to weight restrictions on Sweden’s roads. Despite the more complicated installation process VA Tech successfully installed the transformer, filled it with MIDEL and the transformer entered operation in June 2004. Since this time the transformer has run without incident and M&I Materials have continued to have a close relationship with both Vattenfall AB and Siemens Austria. For example the M&I team have provided support with analysing the Midel fluid to check that the transformer is in good working order. Following the success of this unit Vattenfall AB have installed several more MIDEL filled power transformers on their network, including a 200MVA unit.